Gun mages represent a fairly unique type of profession in most any game setting. For the uninitiated, a gun mage is one endowed with the Gift of magic and a predilection with fire arms, most often pistols. Gun mages are able to channel their sorcerous powers into their fire arms in order to achieve a number of effects depending on the gun mage’s training and personal style. Such effects include granting greater range, accuracy, the ability to slam their target backwards, the ability to play havoc on a warjack’s cortex, or “brain”, or to allow a round to violently detonate like a mortar shell striking its target. These gun-toting arcanists have a compelling mystique about them, and are often painted as talented and capable combatants that you wouldn’t want to run into in some dark alley in Ord’s Five Fingers. Sorcerers with an affinity for gunplay have been practicing and developing their craft for over hundreds of years, but it wasn’t until 580 AR (nearly 30 years before the current canon) that the first Cygnaran school and militant order for gun mages was founded, the Militant Order of the Arcane Tempest. The purpose behind the Order was rather single-minded at the time: to provide political protection for potential gun mages from the Inquisition of King Vinter IV. It wasn’t until the Lion’s Coup in 590 AR that the Order was first utilized for military application. Organized into small, highly-disciplined teams, units of gun mages used their unique abilities to act as “magical troubleshooters”. With their consummate skill and quick-thinking, gun mages are experts at infiltration and guerilla warfare, and they continue to serve the Cygnaran Military as such to this day. 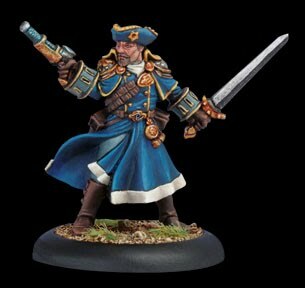 Many gun mages will often take leave from their normal unit to work as part of Cygnar’s network of spies and saboteurs in the Cygnaran Reconnaissance Service. The rise of gun sorcery in Llael had a somewhat different evolution. Due to a long history of noble dueling practices, acceptance of gun mages in the military happened much earlier in Llael than in Cygnar. Gun mages were found as far back as 274 AR as members of the High Royal Guard acting as bodyguards to the king. Centuries later, the Loyal Order of the Amethyst Rose, which was the first militant order made up exclusively of gun mages, was founded in 545 AR, predating the Arcane Tempest by 35 years. Started as a loose society of patriotic noble duelists, the Order of the Amethyst Rose served the Llaelesse crown as the king’s personal agents both at home and abroad. Unlike the regimented teachings of the Arcane Tempest, the Amethyst Rose allowed its members the freedom to develop their own unique arcane talents as gun mages. The result of this practice created an order of sorcerers with a wide variety of special skills. Members of the Amethyst Rose tend to shy away from the demonstrations of power that the Arcane Tempest practices. Instead, Llaelesse gun mages direct their power inwards to improve their gunplay at its core, making members of the Rose exemplary duelists. With the betrayal of Llael by Prime Minister Glabryn and the invasion of Khador, the Amethyst Rose still survives in secret. Clad in the black of mourning for their last king, veteran members of the Order regularly participate, albeit with great apprehension, with the Protectorate’s Northern Crusade in removing Khador from Llaelesse soil. Other members secretly travel abroad searching tirelessly for a viable heir to the thrown of Llael. Others still have turned to mercenary work in order to survive. Another topic of interest is the history and manufacture of Magelock weapons themselves. In 280 AR, more than 300 years before the current canon, the at-the-time lord of Clan Searforge found his clan in a bitter feud that left him bereft of the common raw materials required for manufacturing cortex alloys for steamjacks. Boasting that he would create a new steel without relying on the coal and coke required, the clan lord looked to other exotic materials available at-hand. The result was a reliable, more resilient alloy that made a great alternative cortex alloy, but at the cost of a longer and more expensive smelting process. Until 577 AR, gun mages used weapons crafted from normal steel for their craft. Unfortunately, due to the physical demands created by arcane gunplay, the bores normal pistols burned out at an accelerated rate, so gun mages consequently were forced to constantly purchase new firearms. To combat this, Cygnar’s Strategic Academy commissioned the Rhulic Ironhead Conglomerate to develop a new pistol that could withstand the rigors of arcane reinforcement. Brobek Grauss of Clan Searforge, one of the most noted gunsmiths of the time, recalled the aforementioned cortex alloy created by his clan’s lord hundreds of years earlier. Remembering its ability to respond to arcane energies and its very high melting temperature, Grauss created a pistol from the same cortex alloy and delivered a prototype to the Tempest Academy for testing. The results were staggering. Not only could the firearm withstand the channeled power of a sorcerer, but gun mages were then able to carve reinforcement runes into the barrel itself to attune the gun to the sorcerer. This consequently opened the doors to new and exciting possibilities as gun mages unlocked even greater feats of power. While the Magelock Pistol design is the most commonly used, it has since been adapted to larger weapons like carbines or “Spitfire”, the custom Magelock Rifle carried by the Cygnaran warcaster, Kara Sloan. The Ironhead Conglomerate continues to be the sole distributor of Magelock Steel and is also the exclusive supplier of Magelock weaponry to the Cygnaran military. I hope you guys enjoy these peeks into the history and lore of the Iron Kingdoms. More are on the way. If you have any specific questions or requests, lets hear them.